I just purchased a desktop license, but need to know how to open my online projects into my desktop version. How do I do this? 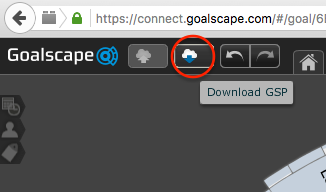 To download your Online projects as .gsp files that you can open in Desktop all you need to do is to sign in to Goalscape Online, then use the 'down from the cloud' button at the top of the screen (see screenshot) and Save the .gsp files somewhere on your hard drive. When you use Goalscape Desktop to open a downloaded project, any Attachments will be available to Download. If you want to switch to a local version of an attachment, download it, Save it somewhere on your hard drive and re-Attach it. Attachments in Goalscape Desktop are implemented as links to the file's location on your hard drive (not as uploaded 'snapshots'), so it will always be the latest version. Any goals that had Comments will have a new tab 'Chat-backup' that contains the entire Comment history (with usernames and timestamps). Note that there is no automatic sync between Desktop and Online. If you re-upload a .gsp file to Online, that will create a new instance of that project, so you will need to do your own version control. If there is anything else you need please post again. Richard Parslow closed this discussion on 17 Nov, 2017 06:01 PM.